Hextrapolate is a flexible number conversion utility for programmers and other people who work with numbers in a digital setting. It converts, in real time, any number in any base representation from base 2 (binary) through to base 36. Numbers can be arbitrarily large, limited only by the availability of system resources. By default, the main window provides spaces for the entry and display of hexadecimal, decimal (base 10), octal (base 8) and binary (base 2) representations, as well as two adjustable fields for the other bases and two for text representation in either ASCII (7-bit text), UTF-8 or UTF-16. 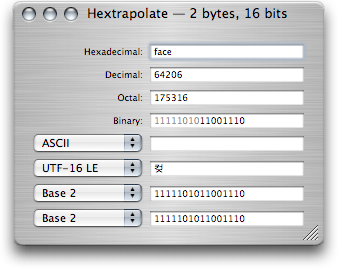 The current release of Hextrapolate requires Mac OS X 10.4 or later. The 1.0-series release which runs on Mac OS X 10.3 (Panther) is also available on the download page. To install Hextrapolate, drag it to your preferred location. To remove it, drag it to the Trash. No automatic version-checking facility is provided.